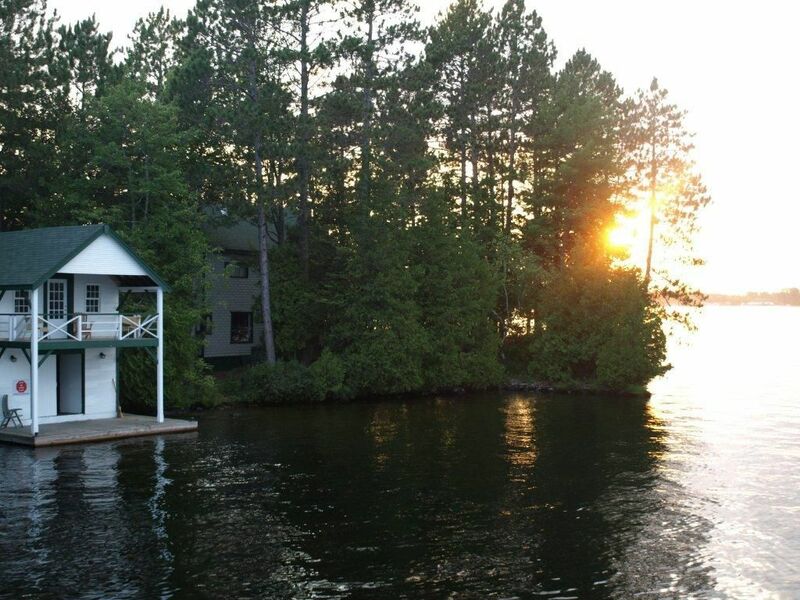 This 3 season cottage was built by my great grandfather in 1906 and was one of the first on Bala Bay. There are four bedrooms upstairs with a 4 pc bathroom. Downstairs has an eat in kitchen, a large dining room, a comfortable living room with wood burning stove, and a TV room that could double as a 5th bedroom with a powder room ensuite which is also accessible from the kitchen hallway. Off the kitchen is a brand new deck and dock with picnic table and BBQ where you can enjoy famous Muskoka sunsets sipping the beverage of your choice. Or if you'd rather, relax in a Muskoka chair at the end of the Point and take in the sunset or the shooting stars from that vantage. A water side hammock is available to enjoy an afternoon snooze or a good murder mystery. The kitchen has all the basics amenities, microwave,new stove, new fridge with plenty of dishes to serve the crowd. There is a spare fridge in the boathouse for overflow. A game cupboard provides entertainment at night or helps while away a rainy day. It's in the blood and, I feel incredibly fortunate that it has remained in the family for over 7 generations. Nothing beats waking up to the call of the loon and knowing I am in Muskoka. Steeped in history the cottage is on a point of land surrounded on three sides by the waters of Bala Bay. Enjoy the sun all day long starting with an early morning coffee and sunrise from the boathouse deck, followed by a midday read/snooze in the hammock or an afternoon swim off the dock. Appetizers and sunset on the deck, then cap your day off with stargazing over the point. Only two miles away across the lake is Bala where you'll find Don's Bakery, the Kee to Bala,banking,grocery shopping, LCBO, marinas, laundromat, and more. Point Manchee is lovely, but the cottage itself had some issues. We were advised not to use a large deck at the rear of the building as it was unsafe. We were advised to be careful on the deck at the boathouse as it had not been powerwashed for the season and was very slippery when wet. The two large newer decks near the water were great, we spent most of our time there. There were septic holding tank issues 3 days into our stay that were never resolved before we left, the agent gave us a number of explanations and promises. We continued to use the facilities during this time but it certainly was an uncomfortable worry for us, not acceptable! We feel we paid a lot of money for this rental and were very disappointed. I'm very sorry you were disappointed with your time at Point Manchee. It is over 100 years old and definitely more rustic than modern. I'm sorry if you thought the photos depicted something different than what is there. I would expect the rainy weather was an unfortunate and unavoidable player in anyone's enjoyment of Muskoka cottage country this summer. It was part of the reason the decks couldn't be power washed in a timely manner. Regarding the holding tank; we try to have pump outs work for every renter, but it isn't always easy to gauge when it will hit the full mark. I am sorry it took so long to be emptied and that it was a worry for you. I am glad to hear you had some time where you were able to enjoy the sundeck and dock next to the cottage, others consider it their outdoor living room. I hope you have better cottage experiences in the future. My wife and I stayed at Point Manchee for a week in July with our three daughters and two other families, and we had a fantastic time. The cottage is a true old Muskoka original, complete with tons of unique knick-knacks and great vaulted ceilings, and the fact that it offers both morning sun and swimming (off the boathouse) and afternoon sun and swimming off the opposite side of the point came in really handy on one of the hottest weeks of the summer. The hammock out at the end of the point also got a lot of use (by me, mostly) and one evening we sat and listened to David Wilcox playing at the Kee in Bala. Everything about the property was as advertised, and Jane was great to deal with. Highly recommended. So this is the second time I've organized a group going and I've had the same reaction: Everyone loves the Point - when do we come back. I was up with several couples and again with Tweens and the mothers - they teenagers lived the freedom. mattresses and are fantastic for sleeping . The water and swimming conditions are great. There is a privacy- because the property is large - which I like. WE love our cottage too and am happy others can enjoy it! Just got back from a lovely stay here. I can't say enough about what a great place this is. I'm actually a bit stumped for words because the list is so long. We got the master bedroom and I am pricing out the mattress right now as it was soooo comfortable. We didn't take children but if you did the multiple access to shallow water is great. Also the tv (we didn't turn it on) is in a separate room which is great for adult alone time. Also the decks are situated so you can be a sun worshipper or settle back under the trees and enjoy a good book. I don't think anyone who is familiar with the Muskoka experience could help but love their stay. We left trying to find future times we could all get together and get back here. So glad you had a great time! Keep coming back! My friends and I have made it an annual ritual to return to Bala to see Sam Roberts Band play and relax a little before the end of the summer. This year we decided to rent the cottage at Point Manchee for a change of scenery. It was easy to get to town but far enough to have a private and wonderful experience. We fell in love the second we pulled up point manchee road! Clearly it is a great family treasure! The location offered beathtaking views from every angle and we loved the personality each of the wall hangings provided - especially the lighthouse light in the dining room! The cottage is a family heirloom - this is very evident but the family has maintained the land with tons of love. With three points of entry to the water, a new dock, and stunning views from all angles the location could not be better! I would suggest and HIGHLY recommend this cottage. If you are lucky enough to get a chance to rent this cottage I would not hesitate! If the Manchee family will have us back my friends and I will be renting out the cottage for years to come! I'm so glad to share our family heirloom and I like to think my ancestors would be pleased that the cottage is being filled with positive happy energy from people who respect and cherish it as if it were their own. Thanks so much. See you next year! The listing and the pictures in the listing were an accurate depiction of the property. This is a charming, rustic property that is perfect for those looking for a quiet, restful getaway. The cottage was clean and well prepared for us to move in. The kitchen has all basic amenities and the deck off the kitchen offers a glorious view of the lake. The slight breeze on the upper deck provides respite from the heat and bugs and the lower deck offers easy access to the lake for swimming. The boathouse deck is a wonderful place for early morning coffee or mimosas! Thank you to the Manchee family for sharing this family gem. Located in the Southwest area of Lake Muskoka the cottage is close to everything; 20 mins from Port Carling Locks and shopping, 30 mins to Bracebridge Falls and more shopping, 20 mins to Gravenhurst where the Muskoka Steamships depart from or visit the Muskoka Boat & Heritage Centre, Farmers markets, Enjoy Bala's Weekly Waterski show and arrange for lessons, Hatha Yoga on the dock with Jazz Arney, Zumba,Exercise classes at the Community center in Bala, Tour the marshes and experience the Annual Cranberry Festival in October. Or kick back and relax on the deck,dock or end of the Point and watch the world go by.